I just got off the phone with an IDF Spokesperson who confirmed, via a special briefing for bloggers, that the bus which was hit by an anti-tank missile less than two hours ago in the Sha’ar Hanegev Region was clearly marked as a civilian vehicle (a school bus), and there was no way the Palestinian terrorists who fired the rocket could have mistaken it for a military vehicle. The Spokesperson noted that this represented a severe escalation of terror emanating from the Hamas controlled territory. We also now know that a teen severely injured in the attack was 13 years old, not 16 as we previously reported. “Hanania Reich, a paramedic who arrived on the scene, recounted the horror. “We were first to arrive together with soldiers. On the road lay a young victim, unconscious and bleeding. We began to resuscitate him and eventually MDA came and evacuated him by helicopter,” he said. Following the attack on the bus fire from Gaza continued, with 45 rockets and mortar shells landing in Israel over three hours. Who’s afraid of CiF Watch? If memory serves me well, the second intifada started with a Hamas ambush of a school bus at a Gaza road junction (a day or so before Ariel Sharon’s Temple Mount visit which those who hate Israel choose to blame). Other attacks on school buses followed. More recently, rocket attacks on Sderot were timed for when children were on their way to and from school. Attacks on children are a consistent and concrete manifestation of the Hamas charter’s pledge to exterminate. Unbelievable, we are the attackers…. I wish there was a BDS of the BBC. Don’t subsidise the BBC. Let it stand on its own – if it can. How much of the current escalation of horror from Hamas is part of the ongoing, systematic terror and how much is it a warning to Goldstone telling him to back off? Natalie, interesting, but I believe that you are overcomplicating matters. This is Hamas being the barbarians they are. Unfortunately, because Israel has caved in to their excesses in the past, they think that if they continue and provide their people as cannon fodder they can force Israel to do so again. I hope not. I don’t live in Israel so perhaps I have no right to advise, but it’s gloves off time, I think, and this time make a proper job of it. “The headline lacks context. 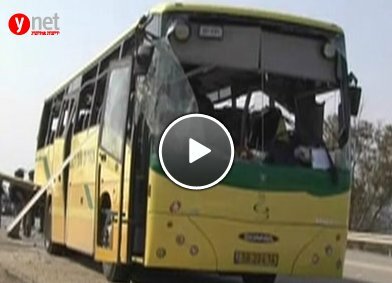 The Israeli airstrike happened AFTER the school bus had been INTENTIONALLY targeted by an anti-tank missile. The bus was marked as a civilian vehicle and the anti-tank missile had to have been deliberately aimed at it. The headline suggests that Israel’s strike actually caused the attack on the Israeli schoolchildren, whereas the strike was retaliatory for that attack. “The BBC deliberately misleads when it embeds the context of the Israeli strike within the article. Also biased is its one-sided focus on the effects on Gazans of Israel’s retaliation. It is well-known that Hamas and its operatives launch missiles and shells from within civilian populations and yet not once is that stated. “I am also disgusted that the BBC resorts to playing the numbers game when it compares Israeli to Gaza casualties when, as I have said above, Hamas takes care to cause as many civilian casualties among its people as it can, to as to draw in the gullible BBC and other main stream media. “And as for “… Both sides seem unable to see the other’s perspective….” Shame on the BBC for abandoning neutrality rather than seeking to educate and for adding to the hatred and bias. Please add your complaints to mine. Faced with deliberate attacks on its civilians, every civilized nation around the world would retaliate and hit back hard. Gaza is not immune because hamas islamists choose to fire rockets from densely populated areas. Serendipity, I would add that since more Germans died in WW2 than Brits, that disparity doesn’t make the Brits the aggressors of WW2 either. TGIAI – the more people who complain to the BBC the better. 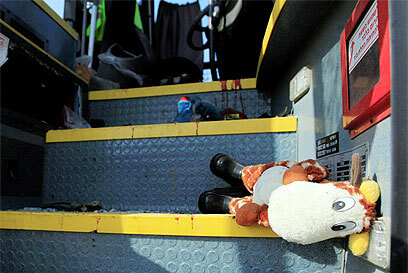 The headline has been changed slightly to “after attack on bus”. Not even “school bus”. If the oil were to run out tomorrow the BBC would be hankering after camels. 1) ‘The Holocaust was the best-kept secret of the war. Then its horrors were revealed – apparently for the first time – by BBC war reporter Richard Dimbleby’s now famous broadcast of 19 April 1945. So shocked was the BBC newsroom that it refused to transmit the recording until, on threat of resignation, Dimbleby persuaded them it was one of the most important news stories of the century. What was not admitted at the time was that the Dimbleby dispatch from Belsen was by no means the earliest news the BBC had received of the destruction of the European Jews. New material, from a five-page directive in the Public Record Office, reveals that by 1943 the BBC had evidence which conclusively proved Hitler’s plan for the “total extermination of European Jewry”. Entitled “Special annexe on Extermination of the Jews: Evidence of Nazi policy and practice”, it was compiled by the Political Warfare Executive (PWE), the government body that guided the BBC’s overseas broadcasting. 2) ‘Conclusive proof that the BBC avoided publicising the Holocaust until the war was virtually over comes from Paul Winterton, a wartime News Chronicle Moscow correspondent and BBC contributor. Eight months before Dimbleby walked into Belsen, he accompanied the Red Army into Majdanek, the first Nazi death camp to be liberated. His account survives in the BBC sound archive. Winterton speaks of “the most horrible story I will ever have to tell you” and describes in brutal detail this appalling extermination camp. “ANTI-SEMITISM in the higher ranks of the Foreign Office and the BBC during the Second World War led to a policy which suppressed news about Germany’s attempt to exterminate European Jews, new research will show this week. The attitude was reinforced by a belief that the British population was anti-Semitic and that anti-German propaganda about atrocities in the First World War, which was often fiction, had made the public sceptical of such stories. Early in the war the Government and the BBC agreed that this time, British propaganda would contrast Nazi ‘lies’ with British truthfulness and a ‘good clean fight’. The evidence is contained in documents from the BBC archives and Government papers at the Public Record Office, which have been uncovered during research for a new Radio 4 series, Document. The first programme will tell of the relationship between the Foreign Office and the BBC between 1939 and 1945. The papers, together with interviews with some of the surviving figures, show that both Foreign Office and BBC officials held a low opinion of Jews, and believed this was shared by the public. Doesn’t firing an anti-tank missile at a school bus count as disproportionate? @Biodegradable, not only disproportionate but it most definitely is a war crime. Israel should pursue this through all the international forums that they can. Our press, IDF spokesmen, government spokesmen etc. all have to stress that this was a war crime. (Yes, I know we’ll be pleading to deaf ears, but we cannot let it pass under the radar). There is no way an anti-tank missile can hit a school bus accidentally. It was a guided missile. They were probably using the best available intelligence, can’t they just say Ooops, like the Israeli’s?